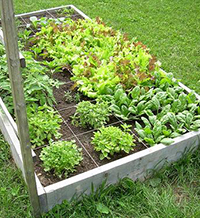 Square foot style gardening involves combining numerous concepts from organic gardening, with a large focus on composting. Typically the design involves building raised planting beds in small defined areas. The object of this method is to take a limited amount of space, and maximize your planting area in the most efficient way possible. The most common design of square foot style gardening is a wooden box with an open bottom, filled with rich organic soil. The box is divided into multiple sections forming a grid. 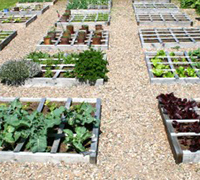 Each square in the grid is then planted with a different plant, with the quantity of plants in each square being based on their size at maturity. For instance a tomato plant gets quite large when fully grown, so that section would most likely contain a single plant. If the area is for other smaller types of vegetables, then it might take 4-6 plants to maximize that space on the grid. If the area is for other smaller types of vegetables, then it might take 4-6 plants to maximize that space on the grid. Taller plants or climbing vines could be planted along the northern edge of the box, to prevent them from blocking the sunlight to the other plants. The key to square foot style gardening lies in the design. Plants are not simply chosen randomly, or put in random locations. There is a unique logic that goes into square foot style gardening. One of the key advantages to this type of garden is accessibility. The smaller planting beds, not only make the garden more adaptable, but also easier to tend because a gardener has the ability to reach every spot in the grid without stepping on the soil and compacting it. This concept of gardening was pioneered by Mel Bartholomew who not only wrote a book on the topic in 1981, but who also was featured in a PBS series on television. 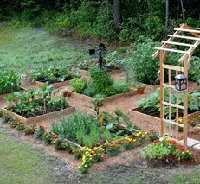 Garden Layouts: It is recommended that you start off with a 4’ x 4’ square garden in your first square foot garden. Make sure to construct a path on each side of the area that is comfortable enough or you to work in. When you are initially laying out your garden, use sticks, garden stakes, or thick wood slats to mark out the entire bed in a 1 foot square grid. This will give you 16 different planting sections in a 4’ x 4’ garden. 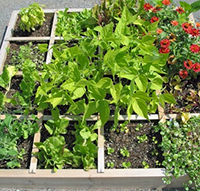 Choose one plant type for each of the squares in the grid. This serves to not only limit the amount of crops that are grown to a manageable number, but it will also help you prevent overplanting and having to thin out the plants later when they begin to crowd out one another. Square foot gardens are all about conservation! Plant Choices: Once you have a little experience with square foot style gardening, you will get a feel for what to plant where and why. As with anything else, experience is your best teacher. To help get your started however, here are a few tips. 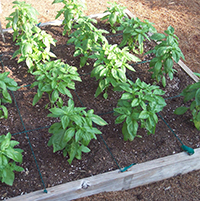 The general rule of thumb when choosing plants is 1 large plant per square, such as broccoli or basil or tomatoes. For medium sized plants such as lettuce or kale, you can plant 4 per square. Spinach for instance will fit 9 plants per square nicely, and small veges like carrots, radishes, or onions can be grown 16 per square. Get the idea? Lay out your plants in a symmetrical pattern in the grid and you’ll get the hang of it fast enough. If you are looking to grow plants that take up a lot of surface area in a garden, like cucumbers or pumpkins, you will need to construct a sturdy frame to grow them vertically. You can use string, twine, or netting to support the crops as they develop. Some plants grow deep into the ground, like potatoes, but don’t worry, you can grow these using square foot gardens too with no problems. Just grow them in a box that has at least 12” side walls so that you have at least 1 foot of framed soil to work with. Maintaining Your Gardens: The best part of square foot gardens is how easy it is to maintain. Remember when we said to make sure you leave enough of a pathway around each side of the raised box to work? This is why! One of the beauties of this design is all the work is done OUTSIDE of the growing area itself, so the soil and plants are never stepped on and compacted. Because you are filling your raised boxes with new, mixed soil, this garden design can be built over top of just about any soil type you can imagine. The fertility of the underlying soil makes no difference. All you need to be successful at this method are a handful of seeds, a little bit of fresh compost, access to water, and a nice bright, sunny location. A creative gardener could even build his or her planting bed on wheels, so it can be moved if needed. Benefits: Probably one of the biggest benefits of square foot style gardening is how easy they are to maintain. In a conventional garden, you frequently have to use heavy tools and put a lot of strain on your arms and back to work the soil when it gets compacted. In this method, you never physically walk in the growing area, so the soil will always stay loose, making it much easier to work with. Since the entire grid is easily accessible from all sides, weeding takes just a few moments. If you properly lay out your plants to maximize the space, your yield will be far greater per square foot due to the rich soil you will be using. You will also find that square foot gardens require much less soil than a traditional garden, not only because the mixture of organic soil will retain water better, but also because the plant density in the garden will actually serve to promote targeted watering.